In the game Dante’s Inferno by Electronic Arts, Dante goes on a spectacular journey through the afterlife to save his beloved Beatrice from the clutches of evil. But what starts out as a rescue mission quickly changes into a redemption story, where Dante must confront his own dark past and the sins he carries with him into Hell. He faces the epic inhospitable terrain of the underworld, huge monsters and guardians, sinister demons, the people and sins of his past, and the ultimate traitor: Lucifer himself. Inspired by the real Dante Alighieri, but adapted for a new generation and a new medium, the hero of the game is a soldier who defies death and fights for love against impossible odds. The Italian mercenary Dante returns home from the wars to find that his beloved Beatrice has been murdered, and her soul pulled down into Hell by a dark force. He gives chase, and vows to get her back. 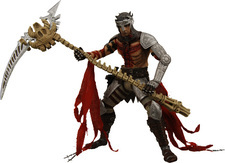 For weapons, he wields Death’s soul-reaping scythe, and commands holy powers of the cross, given to him by Beatrice. 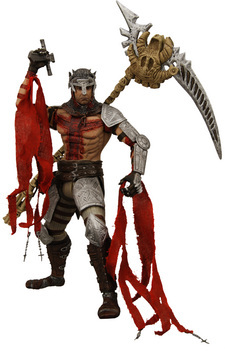 An imposing sight in itself, Death‘s scythe stands over eight inches tall! Not only that, but the blade is detachable for hand-held use. 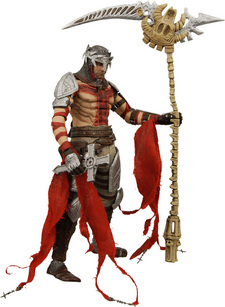 It might just be the coolest videogame weapon ever, and it’s definitely given its due with the Dante figure. The Inferno will never be the same. 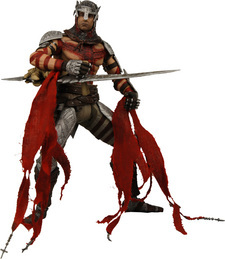 Dante’s Inferno will be released February 9, 2010 on PS3, Xbox 360 and PSP. Our Dante figure will be available in North America exclusively when you pre-order the game from select video game retailers. Stay tuned for further details.